Create beautiful custom printed neckties in silk or polyester fabrics with your corporate logo, product images, or corporate color themes. Custom logo products are traveling advertisements that leave a lasting impression, making them crucial for building brand awareness. Our art department will work with you to lay out full-color designs that will give your company an impressive customized neckwear program. Custom corporate silk neckties are an exquisite item to use as a give-a-way gift to a valued sponsor and an exceptional sales representative. Custom polyester neckties are perfect for introducing a product as a promotional item or use in a company’s uniform apparel program. Our custom printed neckties are produced using a wet dye process that is permanent and will not bleed. This process allows us to fully dye patterns into the fabric with fine detail and brilliant colors. We use a process called wet-dyed screening. The fabric starts off white and all the colors are dyed into the fabric. The dyes are made to match Pantone colors, they are permanent and dry cleanable. Fabrics used in making these custom ties are the same quality you would find in any major department stores. Pricing includes; up to 8 colors, screens and setups. Additional customization can be done by request. Custom neckties can be sized in different widths to meet your style preference. Design ideas and branding concepts can be submitted to our art department for production presentations and review. Contact our in-house graphics department for additional information and artwork rendering ideas. The art department tailors your marketing scheme with our innovative products. 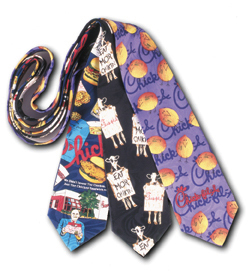 Chick-Fil-A equips each store operator with custom neckwear to distinguish them in a position of authority at each location. 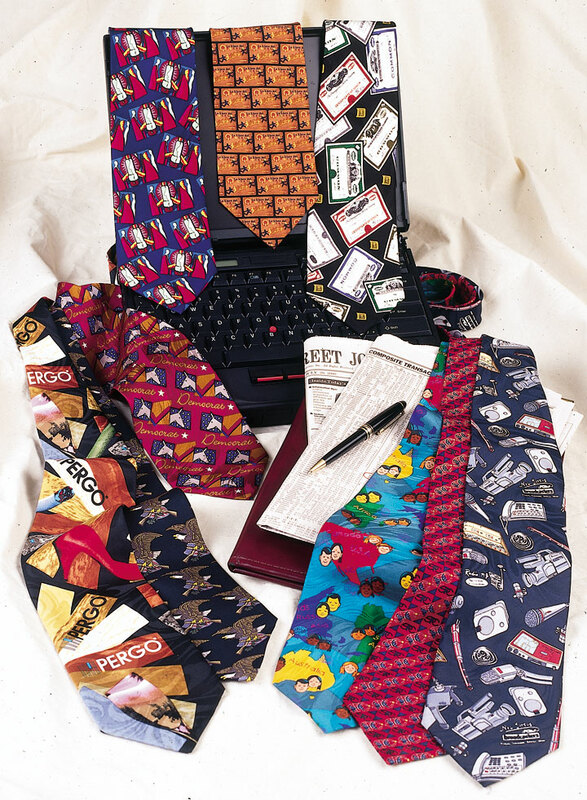 Store operators can choose from up to twelve different necktie designs. Our custom images incorporate many visual elements that are unique to Chick-Fil-A. Such themed elements include their famous chicken sandwiches, their fresh lemonade, logos, and the popular eat mor chikin® cows. Even though Chick-Fil-A is in the fast food industry, the store operators enjoy a professional look that means business.